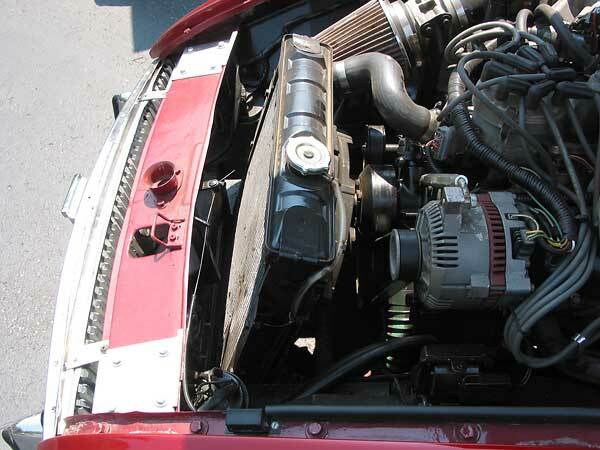 Engine: Ford 5.0 (302cid) high output V8. 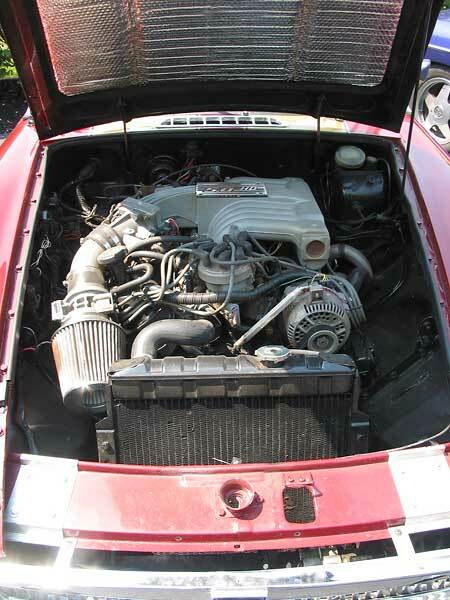 Intake: stock Ford SFI (sequential electronic fuel injection). Wiring: Painless EFI wire harness. 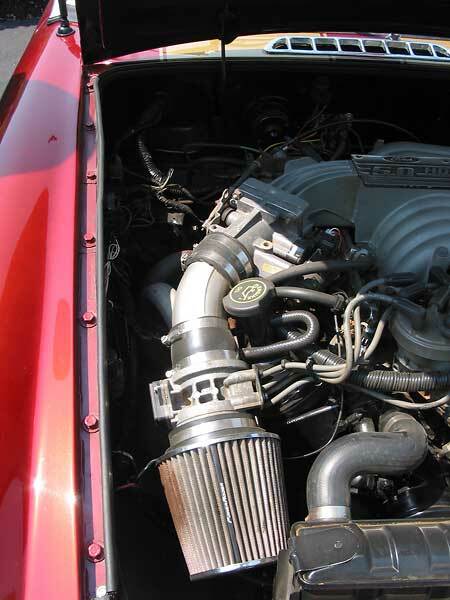 Cooling: 1964 Ford Mustang (brass and copper), plus a GM electric fan in a conventional "pulling" configuration. Exhaust: custom built through-the-fender headers with 3" collectors into 2.5" glass-pack mufflers exiting in front of the rear wheels (i.e. 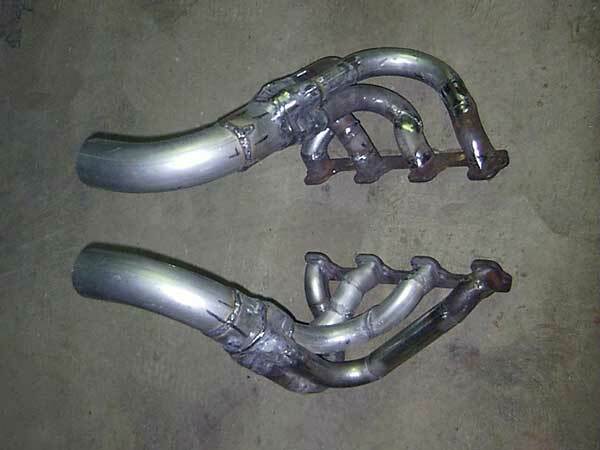 side pipes). Transmission: Borg-Warner T5 5-speed from a 1986 Ford Mustang. 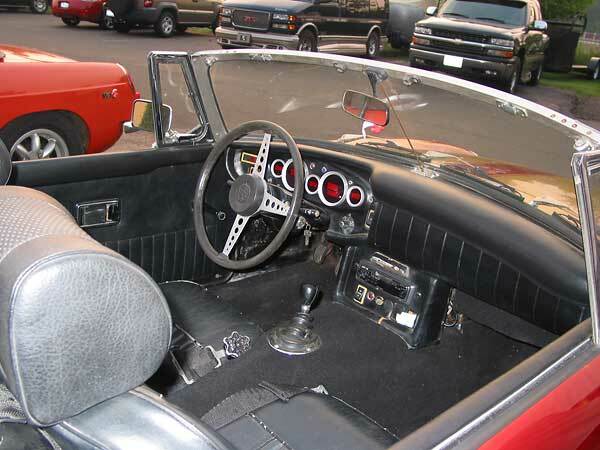 Clutch: stock Mustang clutch with a Toyota pickup truck slave cylinder and stock MGB Master Cylinder. 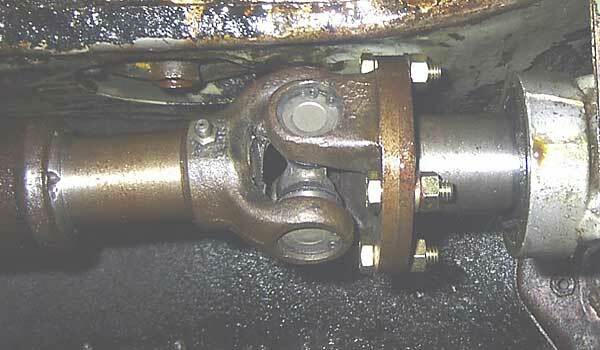 Driveshaft: a custom built adapter to the T5 slip-yoke is attached to the stock MGB driveshaft for now. Rear Axle: 1998 Camaro 3.42:1, with limited-slip differential and disc brakes. The rear axle has been narrowed to 52 inches to fit, and the axles were drilled to 4-on-4.5 bolt pattern as I already had nice wheels. Front Susp. 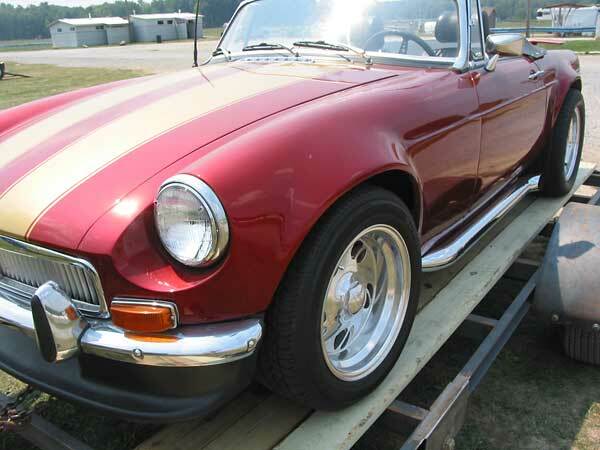 : stock MGB (for now). Brakes: stock MGB discs (front) and stock GM discs (rear). 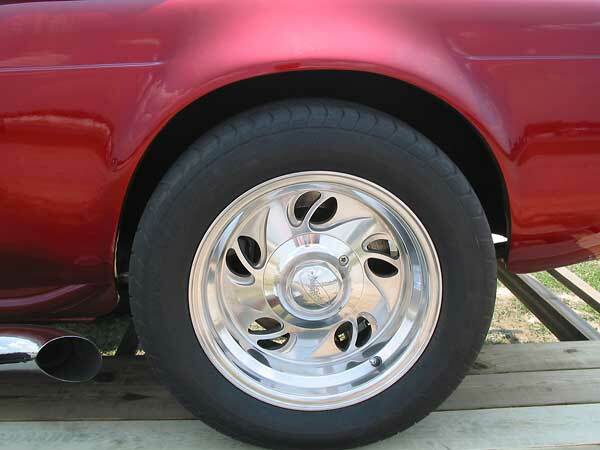 Wheels/Tires: 15 x 8 aluminum Eagles with the 4-on-4.5 bolt pattern all four. 225-50-R15 (front) and 245-50-R15 (rear). Instruments: Cyberdine Digital Gauges (which display 0-60mph time, quarter-mile time, quarter mile ultimate speed, and RPM recall). 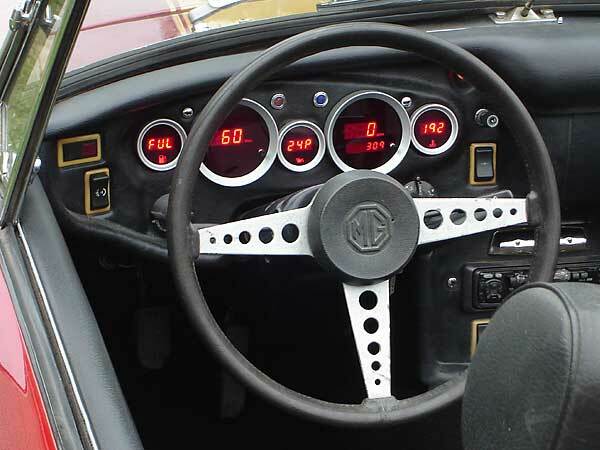 The gauges are installed in the factory dashboard, as shown below. 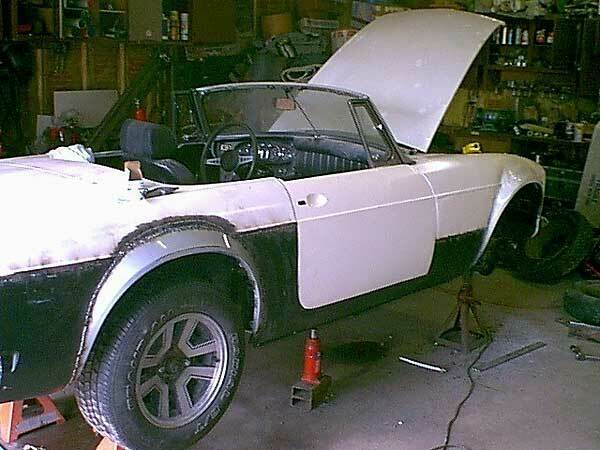 Body/Interior: New MGB body panels from the molding down (to repair rust). Steel fender flares from a Dodge Omni were grafted-in. 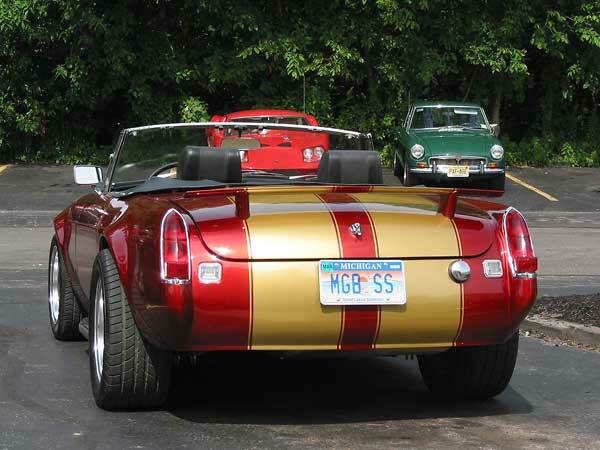 Candy apple PPG paint (red over gold) with skunk stripes. Weight: 2480 (biased 54 percent to the front and 46 percent to the rear), measured with a full tank of gasoline. 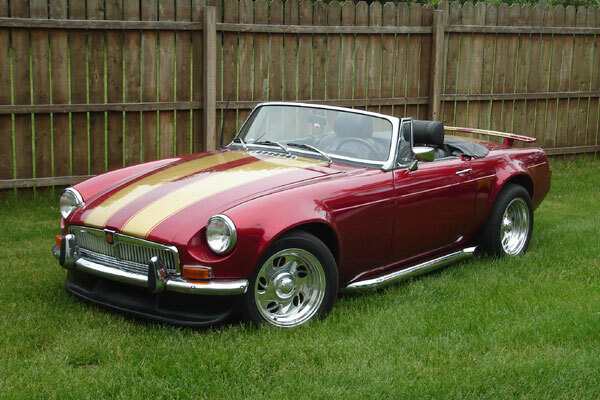 Miles Driven: 1200, as of the British V8 2007 meet. Other: reinforced floor pans and frame members. 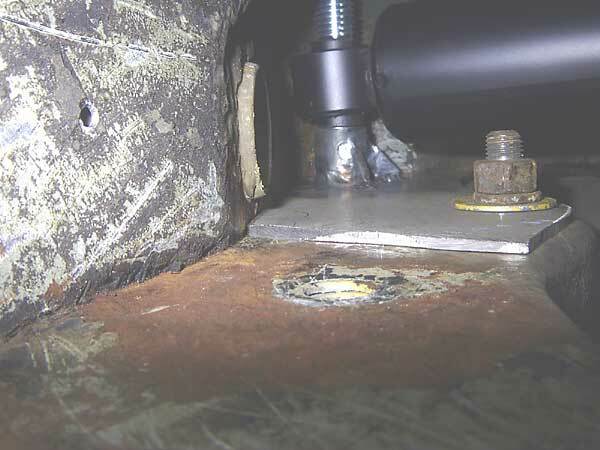 Extra thick rear spring pockets and lowering perches on rear axle. 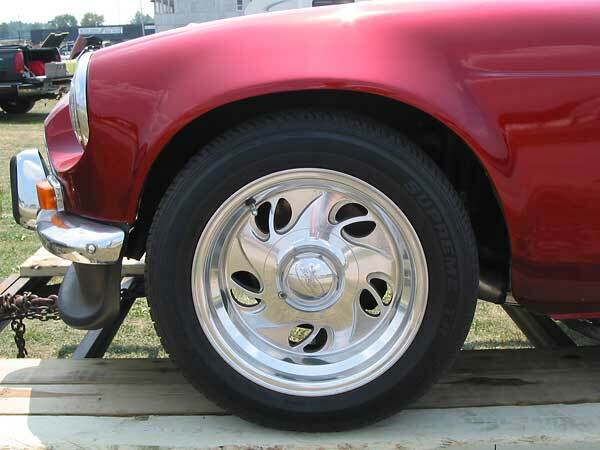 A centered torque bar on the rear axle eliminates axle wrap (i.e. restricts pinion movement.) 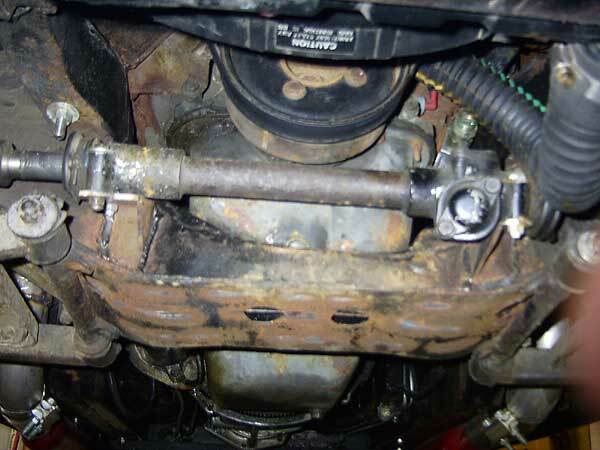 Lowered front steering rack, and modified front crossmember to fit the 302 engine's small front sump. Performance: 0-60 in 6.0 seconds and quarter-mile in 13.4 seconds (September 22nd). Comments: My best sources of information were Steve Carrick and this (British V8) website. Building a car like this involves a lot of trial and error... (and frustration) but it's well worth the effort. I did a lot of cutting and customizing to get the motor as low and as far back as I wanted it. I tried to build the car with as few aftermarket parts as possible. Everything except a few replacement body panels, the EFI harness, and the gauges came from a donor vehicle of some sort. 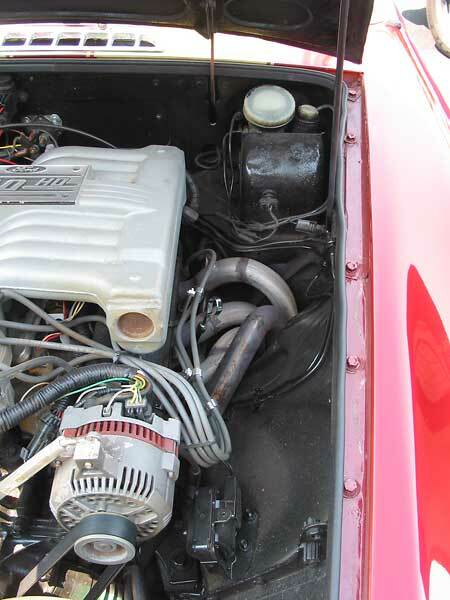 I used the Ford factory fuel pump and fitted the Ford sending unit into the MGB fuel tank. I built the motor mounts, engine brackets, headers, driveshaft, side pipes, axle perches, rear shock mounts, transmission mount, and anything else you can think of. 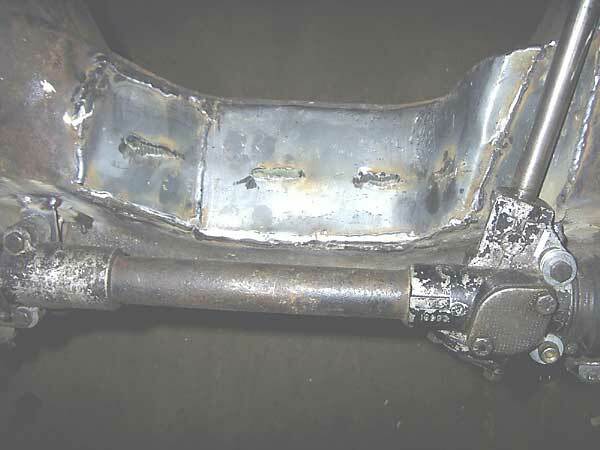 The only problems so far have been a blown header gasket and a "grenaded" (stock Salisbury-type) MGB rear axle. When I build my next one I will start with a rust free rubber bumper car. Other than that, I would do almost all of it the same! 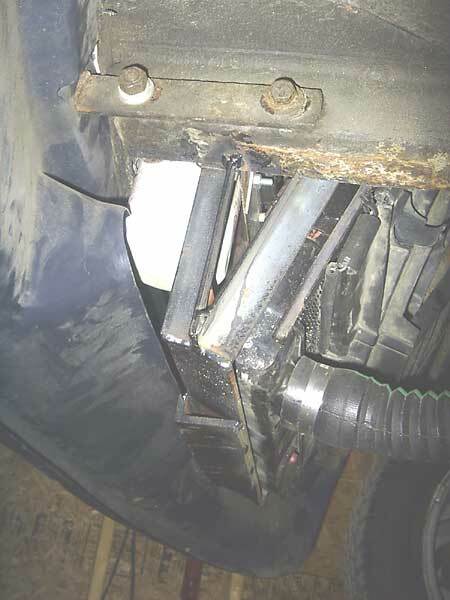 Ford Mustang radiator (tilted to facilitate mounting further forward than usual). Joe built his own headers. 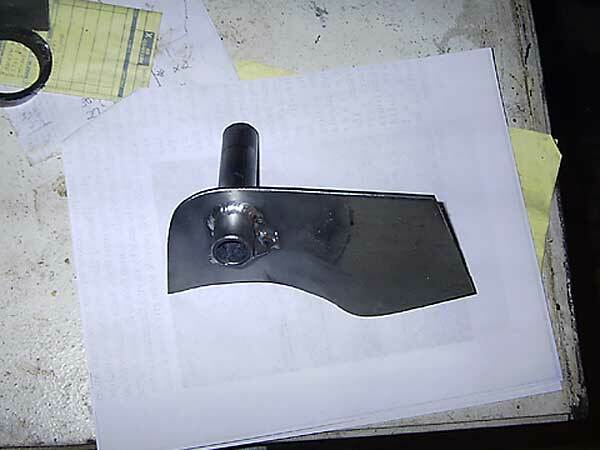 Modified front crossmember (for oil pan clearance). 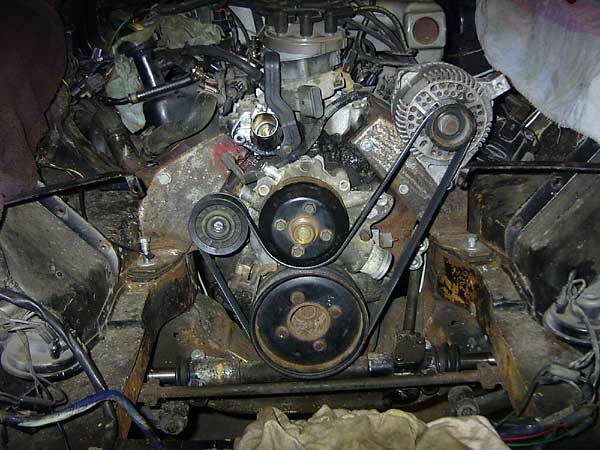 Relationship of Ford engine to MGB crossmember. Motor mounts, engine pulleys, and fan belt. 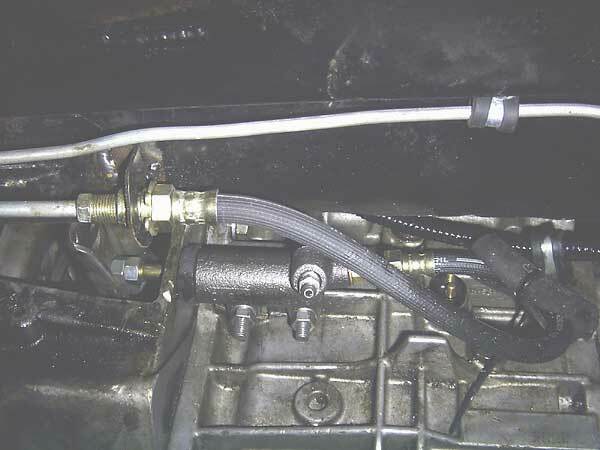 Easily serviceable external clutch slave cylinder. 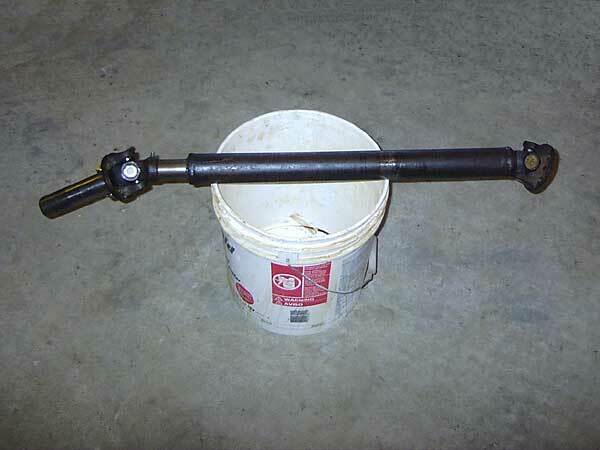 Stock MGB driveshaft, with an adapter to mate to the new transmission. Custom built adapter to the T-5 slip yoke. 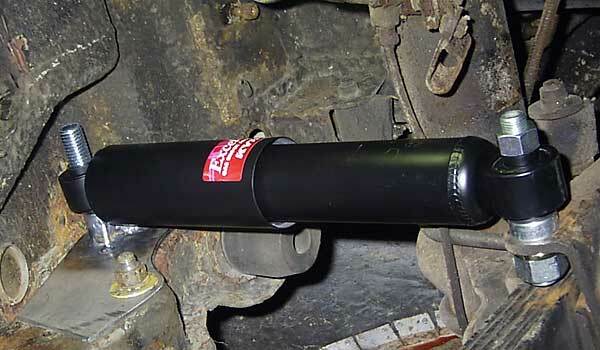 Custom adapter for telescoping rear shock absorbers. KYB shock absorbers for the rear suspension. Installing Dodge Omni fender flares. Beyond the usual data, Joe's digital gauges also display 0-60mph times, quarter-mile times, etc.